The image of an easy forest landscape, habitual for Levitan. Nature, the Russian forest – from childhood childhood familiar image. Over the years, the nature of Russia does not change much. There are still such forests in our villages: with wide, unwrought meadows of wild flowers, with uncut trees, where there are a lot of mushrooms and berries. 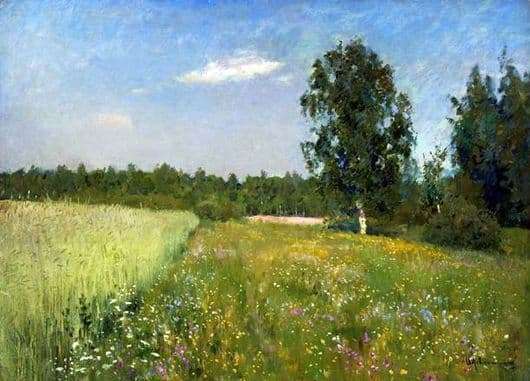 So Levitan tried on the canvas to convey the joy of the jubilant nature of summer. Nature lives, in a hurry to live – summer time is fleeting, alas. Who would not want to be in such a forest! The viewer will feel the aroma of this meadow: bright cornflowers, porridge, bells, daisies… a sea of ​​flowers: it seems that you reach out and collect a bouquet, just like in childhood, or you will tie a wreath on your head from wild flowers. To find a lake near and swim – what a great view would be around the water. In the distance, behind a meadow you can see a forest road – a rather wide sandy road. Perhaps, carriages with horses pass through it infrequently. On such a path it is good to walk in the summer twilight or in the early morning, when dew in the meadow will be tickled by bare feet. Behind a bright, colorful meadow stretch lush green trees. On the right, a birch tree stands alone and a thick bush grows. Away, beyond the road, a huge and dense forest – it is full of berries and mushrooms. Which of you did not go to such a forest for mushrooms, for berries. You can meet a squirrel there and a hare. Sit on the grass, lie down, dream, chew a spikelet, look at the sky. Beauty! The sky is clear, blue, and in some places bright blue. A pair of light clouds in the sky only underlines the completeness of this landscape; emphasizes its lightness and weightlessness. Watching in the picture, you can even feel this fresh forest air and the smell of wild flowers. What a pity that they can not reach out and reach out to them – at least one such to break – a fragrant piece of untouched nature.